I need to put a disclaimer on this post before I lead anyone astray. I am, by no means, the Martha Stewart of wedding invitations. As I reviewed her tips, I was a little overwhelmed with all the must dos. A) Is it necessary to distinguish between a Miss and a Ms. for an adult? Will we cause some sort of Bridget Jones style ice cream eating breakdown when a friend gets our invitation and resigns herself to a life of cat lady Ms.-ness? B) How do I know which of my far away relatives should have the title of Dr.? Does Love Doctor count? I get it. Niceities shouldn't be totally abandoned. This may be more practical invitation guidance though. As a double-ceremony bride (Hindu for my fiancé and his family, Christian for me and my crew), the invitation process of 2 invites, like Extra Sugar Free Gum, doubled the fun. Our Indian invites kept the beauty and tradition of the Hindu wedding whereas we chose our American invites to reflect our panache. Here are a few tidbits I learned along the way. 1) Honor thy parents (or whoever's input weighs heavily in your life). 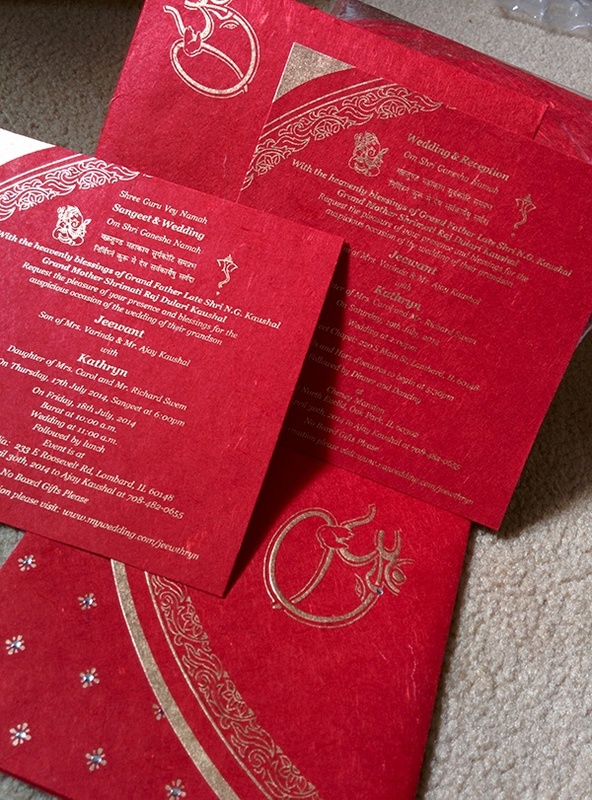 For example, the wording for Indian invitations is crucial. We made sure to review previous Indian wedding invites and asked family from my fiancé's side about our accuracy. For my parents, I also asked for a visual once over. 2) But share your style. 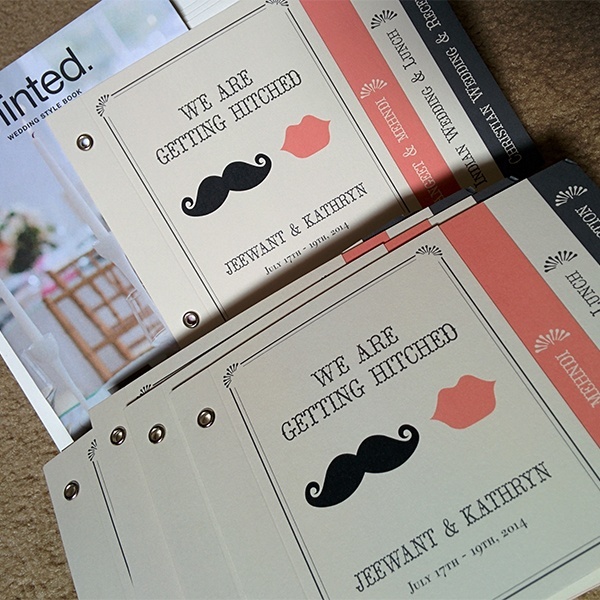 There are endless creative invitations out there by awesome and affordable design sites like Peartree, Love vs. Design and our winner, Minted. Minted stole our hearts with their mini-book format, perfect for our multiple day event. I adore that the invitation style was available for our website background too. Double score!! 3) Who is hosting and who is coasting? The wording on American invitations changes based on who is covering a majority of cost. If someone else is heavily supporting your dream day, give appropriate credit. 4) Proofreading is a beast. Make sure to give yourself ample time for edits. Ours became an epic battle of wits between us and the details. We ended up sending the proof back over 4 times. This delays your invitation send time. We still made the standard 3-4 months-before-the-wedding timeline, but you don't need more anxiety. Planning your wedding causes enough of that already! What do your dream invitations look like? Are there any etiquette tips that must be followed like the 10 commandments? Kate Swem is a recently married lady living in Chicago. 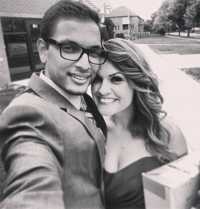 Her husband, Raja, is her blogging coach, fellow Netflixia sufferer (The Strain is now in rotation) and adventure twin. Tune in to hear about her wedding reflections and advice! You can follow her on Twitter, or read more on her and her best friend’s blog, Chi Organic Girls.